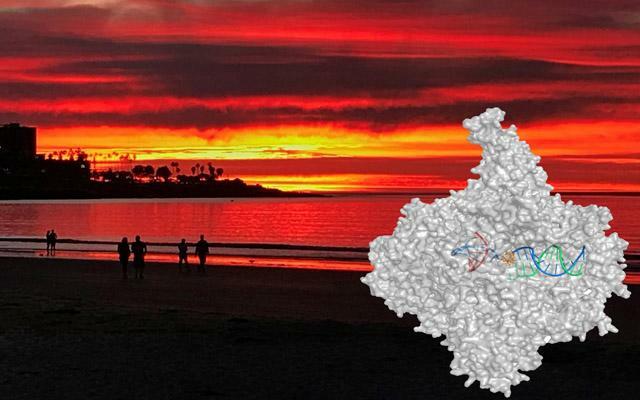 "It's the most active RNA polymerase in growing cells and so its ability to identify lesions has significant influence on whether a cell can survive UV-caused genetic damage," said co-corresponding author Dong Wang, PhD, associate professor in the Skaggs School of Pharmacy and Pharmaceutical Sciences and the Department of Cellular and Molecular Medicine at UC San Diego. "However, little is known about how this enzyme actually processes UV-induced lesions." In the new study, Wang's lab, in collaboration with Carlos Fenandez-Tornero, PhD, molecular biologist, and colleagues at the Spanish National Research Council in Madrid, combined in vitro enzymatic activity studies with electron cryomicroscopy to characterize the mechanisms that stall Pol I as it approaches a lesion to begin recruiting proteins responsible for DNA repair. They found that Pol I is able to sense the DNA lesion through specific interactions with both the damaged base and the DNA backbone, stalling right before the lesion reaches the active site of RNA Pol I.
Co-authors include: Marta Sanz-Murillo and Maria Moreno-Morcillo, Spanish National Research Council; Jun Xu, UC San Diego; Georgiy A. Belogurov, University of Turku, Finland; Olga Calvo, Spanish National Research Council and University of Salamanca, Spain; and David Gil-Carton, Cooperative Center for Research in Biosciences, Spain.